Even though it ‘tis the season to be jolly, the Gutshot Posse ain’t ready to trade in their Stetsons for Santa caps… at least not until the smoke clears after this weekend at Winter WarFare. 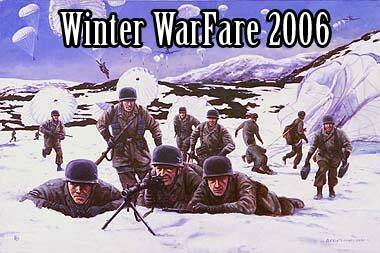 Little Wars, Houston’s premier historical miniatures game store, is hosting it’s second annual Winter WarFair game day, and Hawgleg’s gonna be there with jingles on our spurs. Standoff at K.C. Ranch! The McDermott Brothers were peaceable folk just trying to make their own way in the valley... but greedy eyes coveted their land and sent a few rough-ridin' hard cases to clear 'em out. Good thing them McDermott boys got friends... Join the action as blood flows at dawn! The one-day game day will start at 9 a.m. Dec. 9, 2006 and run until midnight (or later!). It is hosted by Tony Rocha and Chris Pettit of Little Wars game store in Houston, Texas. For details and directions, visit www.littlewars.net. Texas Revolution (Come and Take It)- The Second Battle of Gonzales! AOS using Kiss Me Hardy rules- Help secure England's dominance, or help sweep the hated Anglais from the seas! "CARANGE AND GLORY" NAPOLEONIC WARFARE!! "On 7 September 1812, Napoleon attacked the Russian Army near the village of Borodino along the Moskowa River about 70 miles outside Moscow. While the main fighting was focused in and round the Bagration Fleches and the Great Redoubt, General Poniatowski' s V Polish Corps engaged in a bitter struggle with the III Russian Corps under General Tuchkov. The Poles were to capture the village of Utista and turn the Russian left flank and fall upon the Great Redoubt from the rear. Fighting raged back and forth throughout the day with the Polish finally succeeding in capturing the village, but too late to assist the main French assaults." The battle of Lobositz (1756). Austrian vs Prussian in 15mm. This was the first battle of the Seven Years War and an interesting one because it was the opening battle of the war, Frederick the Great was present, an Irish general led the Austrian army (von Browne). Gutshot- Standoff at KC Ranch! The range war is heating up -- which side are YOU on? Details above.